There are some busy days when a simple salad or sandwich will suffice at dinnertime. Don’t let a hectic schedule get in the way of enjoying a mouth-watering meal—like this fabulous salad. 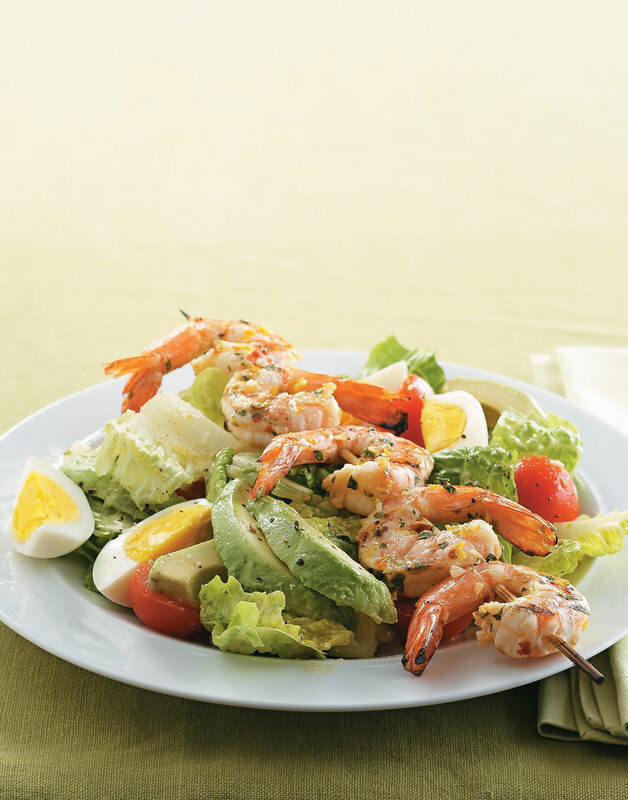 Loaded with shrimp, tomatoes, and buttery avocados, this seafood Caesar has restaurant-style written all over it! For the shrimp, zest the orange, lemon, and lime. Mince the zests together; reserve 1 Tbsp. for the salad dressing. Juice the orange, lemon, and lime. Combine the juices; reserve ¼ cup for the salad dressing. Combine remaining zest and remaining juices in a shallow dish for the marinade with oil, oregano, garlic, pepper flakes, and salt. Add shrimp; toss to coat, then chill shrimp until ready to grill, or up to 1 hour, flipping occasionally. For the salad, whisk together reserved 1 Tbsp. zest, ¼ cup juices, oil, Parmesan, Dijon, garlic, honey, and anchovy paste in a bowl for the dressing; season with salt and pepper. Just before serving, combine romaine, avocados, tomatoes, and eggs in a large bowl; toss with dressing. Thread five shrimp onto each of four metal or soaked bamboo skewers. Grill shrimp, covered, for 2 minutes per side. Serve salad with eggs and shrimp skewers. Zest the orange, lemon, and lime, then mince the zests together. They add intense citrus flavors to this salad. A shallow dish allows all of the shrimp contact with the marinade. Be sure not to marinate the shrimp too long or they'll become tough. This 3 ingredient side dish is delicious and a perfect for pastas or salad.